The arrival of some milder weather is a signal to blow out the cobwebs of winter with a spot of spring cleaning. 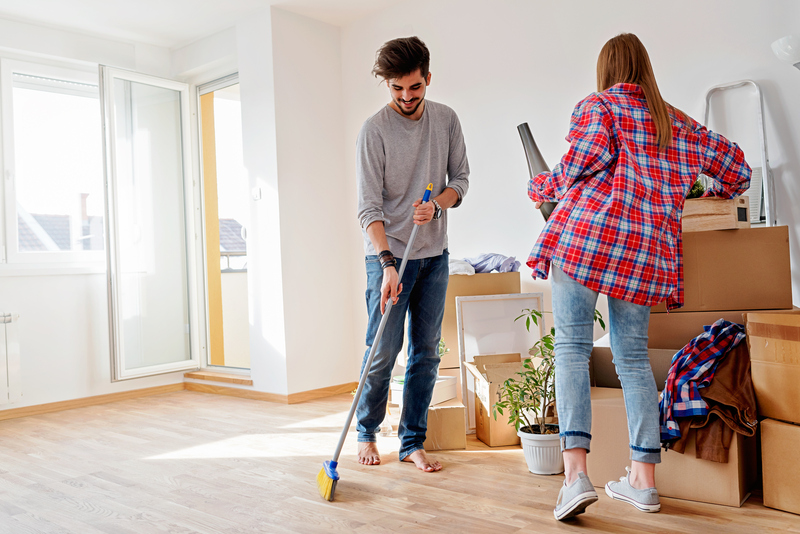 The idea of a large-scale clean of your home and life might seem overwhelming, so we’ve compiled a few handy tips to keep you on track! You should be running the vacuum and mop over the floors on a regular basis (right? ), so let’s focus on some next level cleaning tasks, like cleaning the oven. After a long winter of hot dishes bubbling away you’ll probably have a few baked on splatters to tackle. Take out all the trays and give them a good scrub. Check out how to make a chemical-free oven and stove cleaner at home. Clean out your heating ducts and exhaust fans by removing the covers and giving them a good wipe as there’s probably lots of dust and fibres that have been gathering. Having clean exhaust fans (especially in humid areas like bathrooms) will help prevent mould growing. The best way to tackle this task is to completely empty the fridge and pantry first. Wipe down the shelves and walls to eliminate any sticky spots and funky smells, and remove any ice build-up that may contribute to your fridge or freezer running inefficiently. Make sure things are dry before you start loading things back in. The restocking process will give you a chance to eyeball everything you’ve got in stock. Check expiry dates on all your items, and check your opened items haven’t spoiled or become infested with creepy crawlies. You can also take the opportunity to rethink some of your food and beverage choices – if those sugary and salty snacks don’t align with your springtime health goals, give them the flick! With the days getting longer and the weather more conducive to getting outdoors, spring is the perfect time to set some new health goals. Everyone talks about having a beach body in time for summer, but it’s important to set health goals that are suitable for your circumstances, achievable and sustainable. If you’re keen to build your fitness with running, you might like to try one of our free running guides – we’ve got guides for all running abilities, so there’s no excuse! Perhaps you’d rather kick some health goals as part of a team. Encourage your family and friends to form a team and get a regular workout together. There’s actually heaps of health advantages of working out in a team that you can read about here. You should also take this opportunity to check how your private health cover can help you achieve some of these health goals. If some persistent aches, pains and niggles are preventing you from being as fit and active as you’d like, consider how extras services like physio, chiro, osteo or remedial massage could help get you back in action. A spring clean of your health cover is also worth doing. A lot may have changed since your last cover review; perhaps you’ve moved out of home, coupled up or have gone solo, thinking about expanding the family or in the process of emptying the nest… all reasons to call us on 132 331 or head into a store and get us to check if you’re on the right cover for your circumstances. Spring is the perfect time to be planting herbs and seeds in the veggie patch so you can reap the rewards of a thriving garden throughout the warmer months. Read our mini guide to springtime planting to get a comprehensive list of the best veggies to plant in your garden – everything from Asparagus to Zucchini. Give your garden beds a good weeding and then lay down some fresh mulch to keep your plants happy and the weeds away. Repot any plants that have outgrown their current home. Keep an eye on your newly sown garden to ensure seedlings are getting enough water. Watering in the morning before the heat of the day is best. And see how you can keep the bugs away with this simple home-made spray. Finally, don’t forget to reward yourself! Once you’ve done all the hard work, take some time to sit back and enjoy the surrounds of your clean home, rejuvenated garden and energising health plan. Could you have fragrance sensitivity?